Starting off this list with one of my newest favorite business this year, Ellie Creates. Ellie has a series of unique mugs meant to make you smile first thing in the morning while you have your coffee or chocolatito, and honestly, they do. You will find items that include Icons from our childhood, and famous sayings from your abuelita, and even some new clever ones inspired by dichos, or simply your favorite pan dulce. I purchased the “Richie/Bob” mug, because of what the film “La Bamba” means to me, it reminds me of movie time with my dad and singing along to “Come on, come on, Little sweetheart….”I've received several compliments on it, it’s definitely a conversation starter. One thing that I appreciate about Ellie is the great detail that she puts into the care and shipment of the items, easy if you want to send as a gift! To purchase mugs from Ellie Creates DM her on Instagram, let her know Smiley Shares sent you and she will give you a 5% discount on any mug! 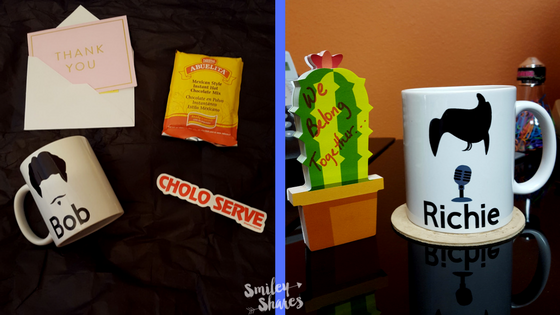 Ellie Creates: (Right Pic) shows all the cute details that Ellie added when shipping the Mug. (Left Pic) Mug at my Office Desk. 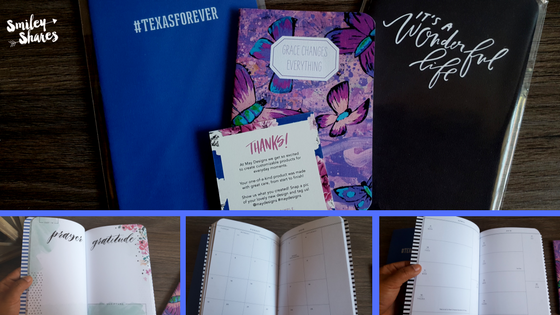 If you’re looking for great quality personalized items, for someone big or small who enjoys writing, coloring, likes being organized, or would like to be intentional with their prayers and moments of gratitude, May Designs can help with that on top of providing many other wonderful items. I first came to know of this Austin based business when one of my friends posted about their notebooks. I am a sucker for notebooks, I don’t always write, but I like having options for when I do, in many cases the notebooks themselves serve as an inspiration. My first purchase from May Designs was during their “Texas” series, to support the Hurricane Harvey efforts. When you purchase from them, you are able to choose the designs (which is hard because they have so many wonderful ones), size of the notebook, selections of pages, and if the design allows further customization. keep in mind, that the notebooks are being customized to you, and therefore be patient with the shipping, it doesn't take super long but do allow more than 3- 5 business days. Trust me, it will defintely be worth it, these products are quality, and prices are reasonable. Don't forget MayDesigns also has Folios, iPhone Cases, Stationery, and other accessories that can be an add-on, even stocking stuffers! MayDesigns has been gracious in offering a 25% discount on full priced merchandise (with the exception of fashion items) from November 29-December 6 add “bg-smiley25” as your code. I would suggest to sign up for their email list, to see what other sales might be going on either before or after just in case that works for you better. If you had the opportunity to read my post from last year, or simply just follow me on social media you know that I love so many of the Whiskey Boat Goods products. But, the reason I decided to include them once again is 1. Morgan and Eddie are great folks! 2. They have grown as a business and that means NEW PRODUCTS!!! 3. I found my favorite scent, yall! 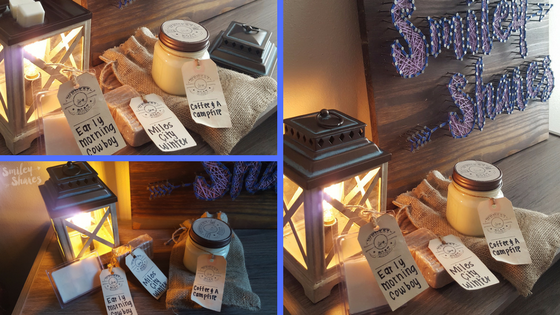 Whiskey Boat Goods, now also has Wax Melts, Soaps, and Reclaimed wood items, and just like with their candles these are all handcrafted in Austin Tx, with absolutely every detail and care taken into consideration from the process of creation to the shipping. I personally haven’t burned my own candle, because I used to live in a small apartment and seemed a bit risky, however, last year I did give one as a gift, she began using it the next day and loved it ever since. I still remember visiting last Christmas break and being able to smell the blueberry cobbler. Now, I do live in a bigger apartment and candles could be an option, however, decided to use my wax melts first simply because the “Early morning Cowboy” scent made me fall in love with it, I couldn’t get enough of the freshly brewed coffee mixed with a hint of leather. Don’t get me wrong, Coffee and Campfire smells amazing, but EMC is the top one right now. Now moving on to their soaps, is because I know they are done with care but also because I found them to be nourishing for my skin, as someone who tends to have dry skin, handmade products tend to work better. I have tried their Country Clothesline, which was great but I am also currently enjoying “Miles City Winter” just because I love the smell of Lavender. I can’t speak too much on their Reclaimed wood items since I haven’t ordered any, however seeing the standards that both Morgan and Eddie have for their products, I’m positive these items will hold the same standards. Whiskey Boat Goods, will like to let you in on their Black Friday sale a little early and enjoy a 30% Discount on all orders between Monday, November 20th- Monday, November 27th by using the code: SmileyShares30 now, I would highly suggest signing up for their emails, as they are always having sales and updates on their latest/seasonal scents. Last but most definitely not least, we’ve got one of my absolute favorite t-shirt brands, Oliver & Otis!!! 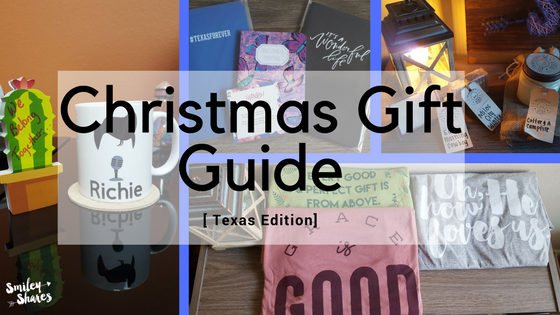 O&O is a family owned/ran business by sisters Arin and Allie, and their mom Patti, they have t-shirts for everyone in the family, as some are unisex, they have several youth designs and even onesies, on top of that they have a series of socks, and some wonderful Texas theme hats. Speaking oTexas-themed items, that’s actually how I began my small O&O collection, I wanted Texas Shirts to be able to wear to concerts and when traveling through Texas. 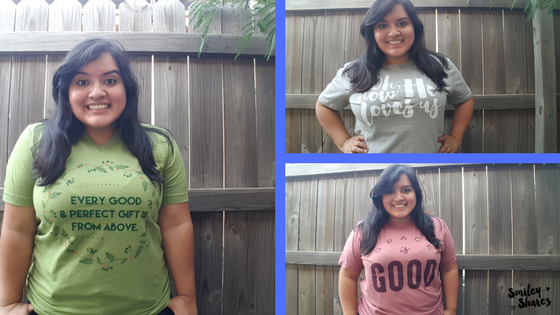 Now, their shirts are a part of my daily wardrobe, not only do I appreciate the designs, whether they are Texas theme or inspired or if there is a spiritual/religious perspective to it, but because the quality on their shirt is great and comfortable to wear all day, and I am all about comfort. They also have some clever tees that included pop culture references. There is definitely something for everyone. I’ve been able to purchase tees on different occasions for my mom, sister, and friends, and they have also loved them. One thing that I would like to point out about Oliver and Otis is their constant changing designs, just a heads up if there is something that you really like; get it right then and there. Their items don’t last long because they are loved by many but since they are all very creative they are continuously adding new designs, and you may not see the one you liked for a while. Thankfully, if you were looking to purchase some of their holiday designs those should be on there for a while. I tried to take pictures of my recent purchases just so you can see the fit on the shirts. Now, if you plan to purchase any of them use code: 20Fall17 to add a 10% to your purchase! O&O: some of their new designs. (Left Pic) V Neck Shirt Size L. (Top Right) Scoop Neck Size L. (Bottom Right) Crew Neck Size L.
There you have it yall! Hope you've enjoyed this as much as I have, now you know more of my favorite business that I care about and support, and hopefully, you can see why I do. With some of these discounts, you can start shopping right now, or even after some of the Black Friday deals, gives you more time to enjoy your family on this Thanksgiving Thursday. With that being said, I would like to wish YOU, and YOUR FAMILY a wonderful Thanksgiving. Enjoy!